Britain's four biggest supermarkets are under investigation by the Office of Fair Trading (OFT) for fixing prices of health, beauty and grocery products. Asda and Morrisons confirmed that the OFT visited their head offices and said they were "happy to assist" the OFT. Sainsbury's and Tesco said they had been asked for information and were cooperating. The OFT would not comment. The OFT also contacted some of their suppliers such as Unilever, Procter & Gamble, Reckitt Benckiser and Mars. "I can confirm that representatives of the Office of Fair Trading have conducted an inspection at P&G's offices," the household goods giant said in a statement. "Consistent with our principles, we are cooperating fully during this process." Mars, Unilever and Reckitt Benckiser also confirmed to the BBC that they had received letters from the OFT requesting information. News of the latest investigation came days after the OFT announced it was looking into allegations that tobacco firms and 11 retailers, including Asda, Sainsbury's and Tesco, had fixed the price of tobacco products. The banking and housebuilding sectors have also been the targets of the OFT recently. 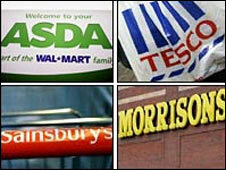 Companies found guilty of price collusion can expect fines under the Competition Act of up to 10% of turnover. Under the 2002 Enterprise Act, cartel-like behaviour may also carry a jail term of up to five years for directors or senior executives involved. The BBC's business editor Robert Peston said the latest OFT investigation could have been sparked after "one supermarket identified possible price-fixing and has attempted to obtain leniency by co-operating with the OFT". He has established that in the recent tobacco case, Sainsbury's has been given immunity from prosecution in return for information. Sainsbury's and Tesco would not say whether their headquarters received a visit from OFT officials last Thursday. A Sainsbury's spokesperson said: "We have been asked for some information regarding a number of suppliers and product categories and are helping the OFT with their enquiries. "We do not have any further knowledge of the details of their concerns." A Tesco spokesperson said: "We understand that the OFT has asked for information from a wide range of suppliers and retailers. We are working with them to provide what they require. "At Tesco we are confident that we always act in the interest of consumers." The number of recent investigations has fuelled criticism from some business leaders over the watchdog's tactics, which have been described as overly aggressive since the OFT's current chief executive John Fingleton took charge at the end of 2005. Mike Pullen, head of competition at the law firm DLA Piper, agrees that the agency has become more aggressive in its approach, but says the OFT is only acting within its powers. "It is a fine balancing act," he said. "You don't want an anti-business culture among the regulators, but there is no point in having regulation unless it is enforced."